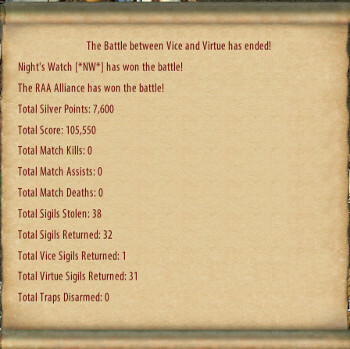 All Vice vs Virtue players have [VvV] appended to the end of their name when in a non-consensual PvP facet. 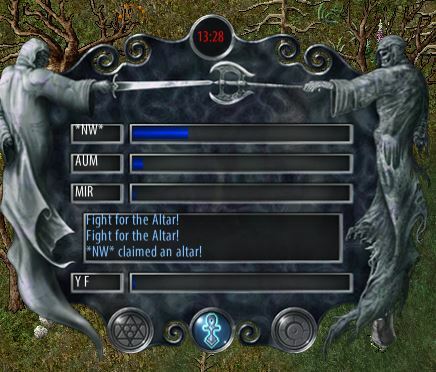 While enrolled in VvV players will subject to stat loss when killed, duration 5 minutes. Claim the altar by being the only guild/alliance to stand on it until all 4 braziers have ignited (about 16 seconds). VvV players will receive silver points during the match that can be redeemed for a variety of rewards. My experience is, 100 silver if you, or a member of your guild, claims an altar, or returns a sigil, 50 points if someone in an allied guild claims an altar or returns a sigil. After a short cool down period if at least 2, non-allied VvV players are logged into the game another battle will start. 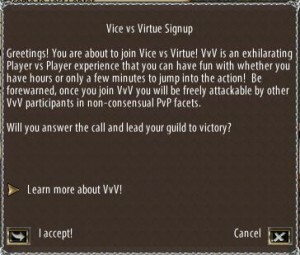 All Vice vs Virtue players will have [VvV] appended to their overhead name when in a non-consensual PvP facet. Non VvV players that unlawfully attack a VvV player will be flagged as Vice vs Virtue Participants and highlight orange to VvV players. 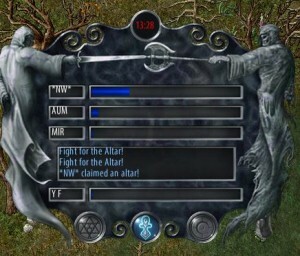 This participation will last until the player is killed by another player, and will be subject to stat loss upon death (five minutes). Non VvV Players that preform beneficial actions on VvV players while in combat will be flagged as Vice vs Virtue Participants and highlight orange to VvV players. Rewards tagged as “Owner: ” are character bound. Silver points will be reset to 2000 each time a player rejoins Vice vs Virtue. Stat Loss Removal – Removes the effects of stat loss, can be used once every 20 minutes. War steeds must also be fed “Essence of Courage” to keep up their battle readiness. (250 silver) A newly claimed war steed has 8 battle readiness, it loses 1 battle readiness when killed, and there is a decay rate of 1 readiness each 24 hours, feeding essence of courage restores 1 battle readiness, 20 units of readiness is the maximum possible. 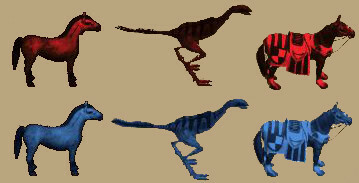 War steeds can be resurrected by their owners using a bandage, this does not need veterinary or animal lore skill.